Therapeutic Yoga is a remedy for the challenges of our stressful times and blends restorative yoga, gentle yoga, healing touch, breath work and guided meditation. The practice creates a calm, supportive and nurturing environment in which you can relax and let go, allowing the innate wisdom of your body to naturally restore balance and well-being. Whether you just need to decompress from stress, recover from injury or deal with chronic illness, this workshop will help your body, mind and spirit to relax, rejuvenate and heal. Live sound of signing bowls and tuning forks will support the body for even deeper relaxation. Claudia Huddleston is a certified Integral Yoga Teacher (RYT500) and has been teaching for 12 years in various locations. After finding great healing and transformation through the practice of Yoga in her own life, she is now passionate about sharing this healing power with others. Her teaching style is inward and compassionate, supporting students to replace self-judgment with self-love and acceptance. In 2011, she became a certified Phoenix Rising Yoga Therapist to deepen her understanding of the bodymind and on how to tap into the wisdom of the body to connect to Self. She teaches advanced asana classes, restorative and therapeutic yoga and focuses lately on working with private students. 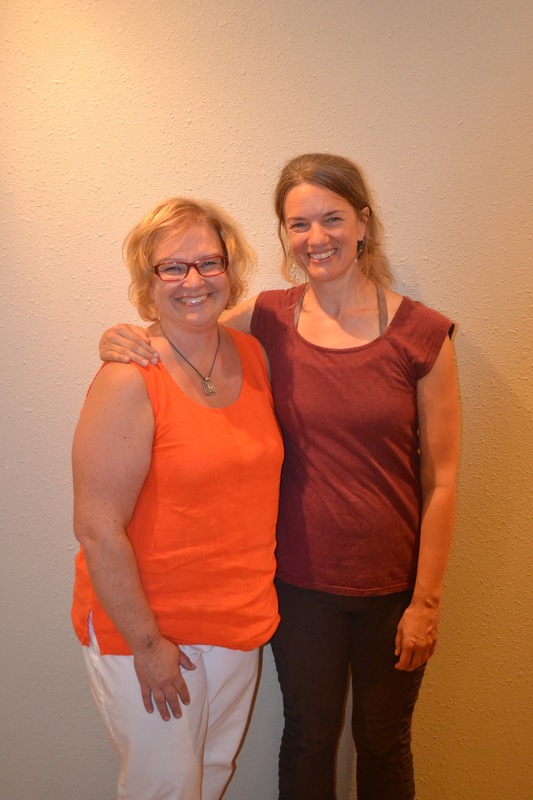 Claudia has been a Shiatsu Massage Therapist since 1997. For more information visit her website www.claudiahuddleston.com. Wednesday November 30, 2016 at 7 – 8:30 pm, 865 52nd street, Oakland. Reuniting the world starts from oneself. In these challenging times we need to live in the moment and remind our body how to relax. The uncertainty of the future may cause fear within us, which shows in tightening muscles and tension in our body. Through the embodied sound practices, we become physically relaxed and our mind follows. And when the mind is stress-free the body feels at ease. In these intimate classes we use qigong, breathing and vocal exercises, mantras and chanting, deep listening and guided imagery teaching the body and the mind to be present in the moment. We end the evening on a 40-minute deeply relaxing sound sanctuary surrendering to the soothing sounds of singing bowls, drums, chimes, and tuning forks. Everyone is welcome! No previous meditation or singing experience required. Bring a yoga mat/blanket to lay down and something warm to cover up for the sound sanctuary. There will be some pillows available. Please pre-register to Minna at minna@harmoniaalto.com. In this small group you will release tension and pain and improve movement and ease. We will start with vocal meditation. Live sound of various instruments will support the poses and take you deeper in your relaxation. We will end the evening with complete relaxation through sound healing meditation. NOTE: This event will sell out, so reserve early! Private Sound healing sessions in Albuquerque available Saturday, Monday and Tuesday (November 19, 21 and 22) at 10 am – 6 pm. Reserve directly with Minna at minna@harmoniaalto.com. Purpose of this study group is to explore ways to use multi-hand cranio sacral therapy and sound healing as a combined practice. Using an Ancient tradition that is effective and proven to to reduce stress, create a deep sense of peace and well being using vibrational sound. Sound therapy is one of a growing number of subtle-energy therapies that make up the field of vibrational medicine. Each part of our bodies has it’s own natural resonance, and vibrational medicine that is based on the idea that disease is a result of those natural resonances getting out of tune. Weather due to stress, illness or environmental factors. Sound vibration acts as a carrier to teach the body and mind how a sense of wellbeing feels. As this memory is embodied it is easy to access it trough out our everyday lives. You will leave rejuvenated with a deep sense of calm and well-being. Come join us for an afternoon of gentle yoga, sound healing and meditation as we work with grief to transform and purge the soul of pain and heartache. Have you experienced a loss (death of a loved one or pet), gone through a major transition (loss of home, job, relationship) or simply identify with being in a state of bereavement knowing that even though you have coped with it in the best way you can, you still feel that heavy blanket of grief? This workshop was created just for you. Learn breathing exercises and yoga poses to help you cope with overwhelming emotions that come with loss and dip into a bath of sound to ease the grieving heart. Together we will explore creative ways to express and move through grief both individually and collectively. Join a circle of compassion and non-judgement to allow each participant to uniquely and authentically honor his or her loss. Fee: $70 when pre-registered and $80 at the door – Nobody will be turned away due to lack of funds. Please contact amyhyunswart@gmail.com if you are in financial need. What are you holding onto that no longer serves you? Come to experience how to recognize and release your old patterns that no longer serve you using variety of breathing and vocal practices, qigong, seed syllables, mantra, chanting, and story telling. We end the evening on a sound sanctuary surrendering to the soothing sounds of singing bowls, drums, chimes, and tuning forks. Each class is different, so I recommend coming to all of them and receive a tool kit for a life time of practices! $25 / class at the door (cash or check) or bring a friend and safe – $40 for each class for two of you! Anna itsellesi hetki aikaa pysahtya ja kuunnella kehon ja sielun sointua. Tule tutustumaan Sonic-meditaatioon. Sonic-meditaatio auttaa mm. vahentamaan stressia, parantamaan keskittymiskykya ja rentouttaa seka kehoa etta mielta. Tuo mukanasi avoin mieli, joogamatto ja jotain lamminta, johon voit kietoutua rentoutumisen ajaksi. Aikaisempaa kokemusta ei tarvita. Come unite body, heart and spirit as one harmonic force to help recognize and release old patterns that no longer serve you! After and introduction to the practice of sound healing, we will explore a variety of breathing and vocal techniques, then ease into a deep yin yoga practice accompanied by live sounds to further open the physical and energetic body and allow us to let go in long, luxurious stretches. We end the evening with guided meditation and sound sanctuary surrendering to the soothing sounds of sining bowls, drums, chimes and tuning forks. Everyone is welcome! No previous yoga, meditation or singing experience required. Reservation is confirmed with payment. Register www.yogarocks.fi (workshops/events page) or at yogaROCKS. Leta LaVigne, (E-RYT 200, RYT 500) is a Seattle native and head teacher and owner at yogaROCKS. She has diverse background in teaching since 2008 having started with hot yoga and moved into vinyasa flow and yin. She draws from all of these traditions to craft intuitive classes that often combine both dynamic movement and the depth and stillness of yin asanas, drawing awareness through body, muscle and bone, to the subtle breath and inner landscape. She strives to teach with a functional approach rather than relying on alignment rules based on how a pose should look. A functional approach stresses the “why” as much as the “how”, and encourages students to customize their practice for their won unique body. Sonic meditaatio auttaa mm. vahentamaan stressia, parantamaan keskittymiskykya ja lisaa luovuutta. Aloitamme helpoilla hengitys ja aani harjoituksilla, joiden tarkoituksena on puhdistaa mielta, tasapainottaa kehomme omaa varahtelya ja auttaa keskittymaan tahan hetkeen. Taman jalkeen rentoudumme vastaanottamaan erilaisten instrumenttien harmonisia sointuja koko olemuksellamme. Tule tutustumaan Sonic-meditaatioon haltijoiden ymparoimana. Tee matka haltijoiden maailmaan harmonisten sointujen avustamana ja kuuntele mita haltijoilla on sinulle kerrottavaa! Tuijan ihaniin haltijoihin voit tutustua enemman taalla http://pienihaltijakauppa.fi/. Get tickets at eventbrite or at the door. Bring a friend and safe – $140 for all 4 classes / or $40 for each class for two of you! The heart is a fire element organ, associated with the emotions of joy, love, passion and creativity. When the heart is properly supported, these emotions are available and balanced. When the heart is overstimulated, excess nervous energy, anxiety and insomnia can present. Sound healing is being utilized for its immersive ability for entraining the heart with the sound vibration and thus enhancing the healing process. Heart Opening- This activating treatment uses a unique blend of sound and acupuncture to encourage an opening and expanding of the heart center. As we work to stoke the fire, increasing capacity for passion, creativity and love is the main focus. Heart Nourishing- This treatment uses soothing and sedating sound and acupuncture techniques which stimulate the parasympathetic nervous system and drain excess energy from the heart center that might be presenting as anxiety and sleeplessness. We will focus on rooting the excess energy into the lower body where it can be used more efficiently. Fee: $40 / each – register early here – space is limited to 5 for each session. Elena Herschberger is a licensed acupuncturist and Chinese medicine herbalist. She graduated with a Masters of Science in Oriental Medicine from Acupuncture and Integrative Medicine College, Berkeley. Elena is inspired by the mind-body-spirit connection that is inherent to all forms of traditional healing and strives to bring her patients to an elevated level of wellness. Utilizing modalities such as cupping, gua sha massage and qi gong exercise instruction, she is able to help her patients reach their health goals in their own unique and varied ways. Elena is a passionate advocator of self care and believes in empowering her patients with knowledge of nutrition, self-diagnostics and massage as a means to a life-time of good health. In this small group you will release tension and pain and improve movement and ease. We will start with simple breathing and vocal exercises continuing gently to asanas and movement. Live sounds of various instruments will support the poses and take you deeper in your relaxation. Then we transfer to deep relaxation through Yoga Nidra. And finally we will end the evening with sank even deeper with sound healing sanctuary. 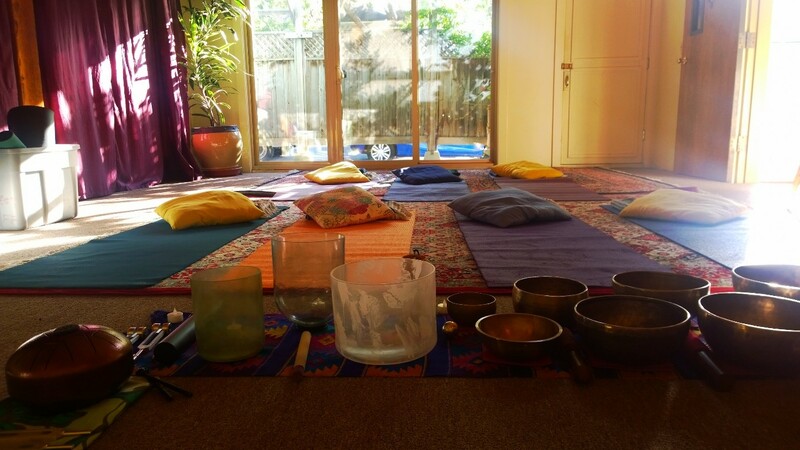 Private Sound healing sessions available Tuesday – Thursday (July 5 – 7) at 10 am – 6 pm. Reserve directly with Minna at minna@harmoniaalto.com. Few sessions on Wednesday and Thursday still available! Donations are welcome. No prior experience is needed. Elise Youssoufian is a vocalist and voice teacher based in Oakland and immersed in folk music and sacred music from around the world. As a student of master musicians, she continues to refine her voice and delights in offering individual and group sessions to share the transformative possibilities of the vocal arts. Learn simple practices using breath and vibration of your own voice to recognize and release your old patterns that no longer serve you. We end the evening on a sound sanctuary surrendering to the soothing sounds of singing bowls, drums, chimes, and tuning forks. Everyone is welcome! No previous meditation or singing experience required. Please bring a yoga mat and blanket for maximum comfort. Bring a friend and get tickets for both for $30 in advance / $40 at the door! Join me on a transforming journey into ultimate possibilities. Learn simple practices using, breath, vibration of our own voice and mantra to clear our body and mind. We end the evening connecting to the ultimate possibilities through guided meditation and deeply relaxing sound sanctuary with soothing resonance of singing bowls, drums, chimes, and tuning forks. In this workshop you will learn a variety of techniques that release stress, tension and anxieties, and are easily applicable in daily life. We will activate the relaxation response through stimulation of the vagus nerve by using breath, voice, gentle movement and asanas. These practices will be enhanced with the healing vibrations of singing bowls, drums, chimes and tuning forks. Claudia Huddleston is a certified Integral Yoga Teacher (RYT500) and has been teaching for 12 years in various locations. After finding great healing and transformation through the practice of Yoga in her own life, she is now passionate about sharing this healing power with others. Her teaching style is inward and compassionate, supporting students to replace self-judgment with self-love and acceptance. In 2011, she became a certified Phoenix Rising Yoga Therapist to deepen her understanding of the body-mind and on how to tap into the wisdom of the body to connect to Self. She teaches advanced asana classes, restorative and therapeutic yoga and focuses lately on working with private students. Join us on a transforming journey into bliss and learn simple practices from ancient cultures around the world. Our journey begins with breathing and vocal exercises to tune in to our own vibration. We continue by tapping into stress-causing issues and offering space for release. We end with a deeply relaxing sound sanctuary – surrendering to the soothing resonance of singing bowls, drums, chimes, and tuning forks, guided gently to a close with vocal meditation. Everyone is welcome! No previous experience required. Elise Youssoufian is a vocalist and voice teacher based in Oakland. Her individual and group sessions offer space for the transformative possibilities of the vocal arts. Start the final day of New Living Expo with Vocal and Sound meditation. You can find me outside with the SF Integral Yoga Institute. Join us on a deeply relaxing journey to release stress and anxiety! Learn simple practices from ancient cultures around the world, as well as scientifically proven methods you can take home and start using immediately. The human ear is connected to virtually every organ in the body through the vagus nerve. When we listen to sounds and use our voice we stimulate the vagus nerve, which carries 75% of all activations in our parasympathetic nervous system. It carries incoming information from the nervous system to the brain and sends outgoing information that regulates heartbeat, muscle movement, breathing and digestion, supporting relaxation response. Our journey will begin with simple breathing and vocal exercises to tune into our own vibration. We will continue by tapping into issues that cause us stress and offer space for release. We will end the day with a deeply relaxing sound spa, surrendering to the soothing sounds of singing bowls, drums, chimes and tuning forks, guided gently to a close with vocal meditation. Bring a yoga mat or blanket for maximum comfort. Please pre-register – space is very limited! Elise Youssoufian is a vocalist and voice teacher based in Oakland and immersed in folk music, sacred music, and sound healing modalities from around the world. As a student of master musicians, she continues to refine her voice and delights in offering individual and group sessions to share the transformative possibilities of the vocal arts. Do you want to reduce stress, be better focused at work and be more creative? Get a taste of the unique Sound Connection classes that use sound vibration to supercharge your meditation practice relaxing your body and mind. We start with simple breathing and vocal exercises and end with deep relaxation supported by soothing sounds of live instruments. No previous experience required – just come and check it out. Benefits include reduced stress, balanced nervous system, enhanced focus at work and deep relaxation. The evening is dedicated to activation of the vagus nerve.The vagus nerve carries 75 percent of all parasympathetic activity—the signals that tell our body it is okay to rest and digest. When it is stimulated by soothing sounds—and particularly when we sing—we are sending a message of calm and relaxation to every part of our body. Aloitamme tunnin helpoilla hengitys ja aani harjoituksilla, joiden tarkoituksena on puhdistaa mielta, tasapainottaa kehomme omaa varahtelya ja auttaa keskittymaan tahan hetkeen. Taman jalkeen rentoudumme vastaanottamaan erilaisten instrumenttien harmonisia sointuja koko olemuksellamme. Tuo mukanasi avoin mieli, jooga matto ja jotain lamminta, johon voit kietoutua rentoutumisen ajaksi. Aikaisempaa kokemusta ei tarvita. We’ll start the class with short introduction to sound and vibration and how it supports our wellbeing. Then we really dive deep into the practice itself combining sound and slow movement. We’ll get our inner vibration going by easy breathing and vocal exercises that help us to release stress as well as align and open our body and mind. Soothing live sounds will continue to support us as we move into the restorative yoga poses. We will finish the evening deepening the relaxation through meditation and sound journey. fee: 45 Euros / 35 Euros for members. Pre-registration recommended (only 17 spots) here. Kärsitkö kiireestä ja jatkuvasta riittämättömyyden tunteesta? Tee matka omaan itseesi ja palauta voimavarasi joogan, oman aanen ja rentouttavien sointujen avulla. Perjantai iltana ravistelemme viikon kiireen pois ja rentodumme vastaan ottamaan harmonisia sointuja koko olemuksellamme. Lauantaina ja sunnuntaina keskitymme stressin poistoon seka kehon ja mielen vahvistamiseen liikkeen, hengitys- ja aaniharjoitusten seka rentoutumisen avulla. Erilaisten sointujen varahtely avustaa meita matkaamaan syvemmalle omaan olemukseemme. TILAISUUS ON LOPPUUNMYYTY / SOLD OUT! Outi on YogaSoul:in omistaja ja aloitti joogan harjoittelun Jyväskylässä 2002 ja 2004 opettajakoulutuksen Suomen joogaopistolla. Han on opettanut joogaa päätyökseen kymmenen vuoden ajan ja samalla myös opiskellut joogaa Suomen joogaopistolla sekä useita kertoja Intiassa. Tule tutustumaan Sonic-meditaatioon haltijoiden ymparoimana. Tuijan ihaniin haltijoihin voit tutustua enemman taalla http://pienihaltijakauppa.fi/. Cost: 15 euros – cash only.